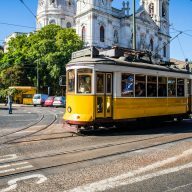 The best way to explore Lisbon? On foot? By a tram? By a tuk a tuk? How best to explore Lisbon to see everything and experience what the Portuguese capital has to offer? Lisbon is not a city that can be visited in the same way as Rome. You have to feel it, you have to experience this place. There are no great monuments that you can tick off your list. Lisbon is best seen by getting lost in its winding little streets. 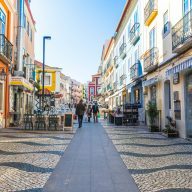 There are, of course, a few places to see and if you’re in Lisbon for a short vacation, you definitely want to see them all. The city is not large and it is easy to spend the whole day walking. However, the fact that the capital was built on the hills makes it not so easy to reach every place, especially on hot summer days. 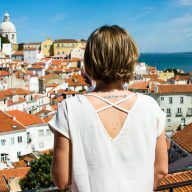 So how best to visit Lisbon? You will learn about this from this post. These kind of trams are the symbol of Lisbon. Transport in Lisbon is not as developed as in London, but there is no shortage of options here. We have subways, trains, buses, trams, ferries, scooters, bicycles and taxis. Everyone will find something for themselves. One of the best options is, of course, the metro. A few lines that Lisbon has get to the most important places in the city. Trains are not that crowded, but during the day they leave on average every 10 minutes. Lisbon trams are very popular. Line 28 goes through most attractions and it is a real entertainment for tourists. The streets here are filled with electric scooters, bicycles and other vehicles that can be rented for minutes. It is an ecological and fast way to move around the city. As a tourist you have a lot of options to choose from. In addition, everything is really cheap! Do you want to visit Alfama, Belem or Bairro Alto? Nothing easier! Sightseeing in Lisbon is very simple. 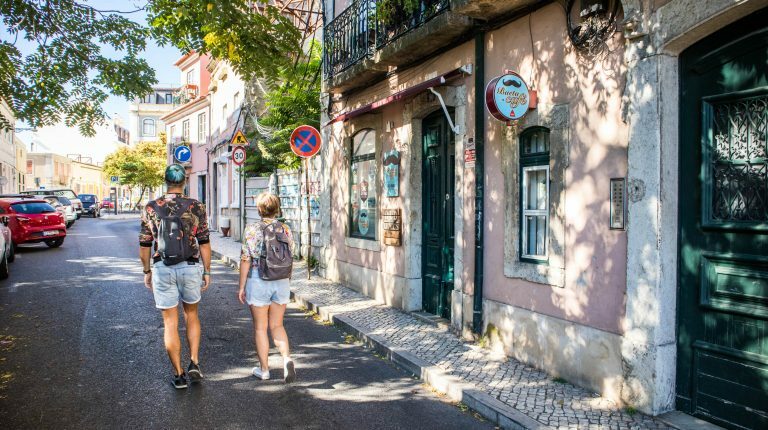 Here are the best ways to explore Lisbon. 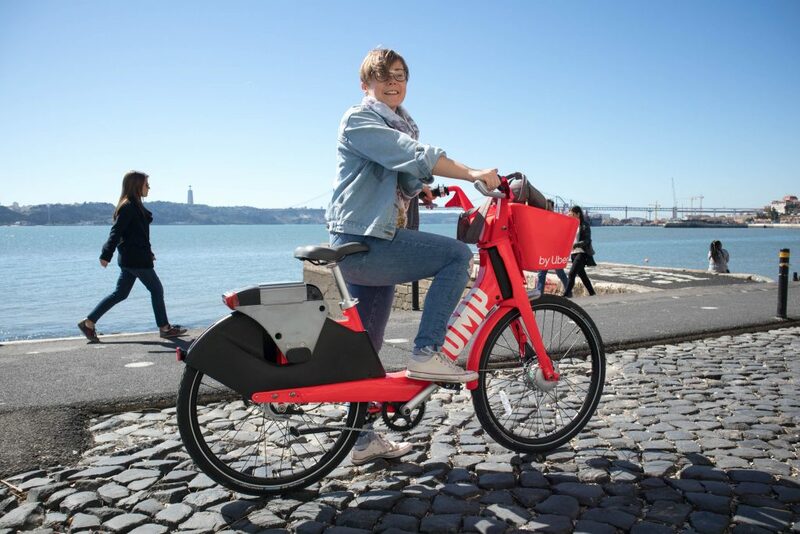 In my opinion, this is really the best way to explore Lisbon. It is worth getting lost in the narrow streets, feel the atmosphere of these most famous neighborhoods, like Alfama. Well, and you do not have to pay for tickets and this is a good exercise. There is only one big disadvantage – Lisbon is located on the hills. In the summer, when temperatures exceed 30 degrees, climbing to the viewpoints is a real effort. Then other means of transport come to help. Ascensor da Bica: a 19th-century cable car is on the steepest hill. Ascensor da Gloria: will allow you to see the roofs of Lisbon in a few minutes. Ascensor do Lavra: the oldest one and the least touristy. Lisbon trams are already legends. They look very cool running through the narrow streets of the city. The 28 Line ride is a great way to visit the city’s main attractions and see something extra. A ticket for the Remodelado tram, that is older, more historic, costs 2.90 Euro and can be bought from the driver. In Articulado (modern tram) you can buy a ticket in a special machine, in the middle of a tram. A much better option is to buy a 24-hour ticket for 6.40 Euro, which will also allow you to use the elevators and allow you to explore the whole day. In the center, tuk-tuk rides are available. They are small cars that are really fast. Drivers organize pre-arranged trips or can take you on a ride to the places you want to see. Tuk-tuk rides around Lisbon cost differently, from 20 Euro to 120 Euro. See options here. Electric scooters appeared relatively recently, but they have already changed the face of the city. 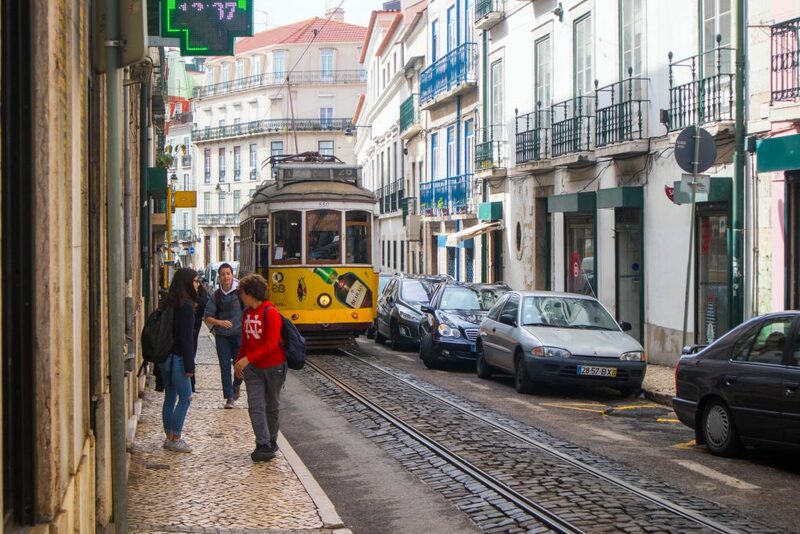 They are used not only by tourists, but also by younger residents of Lisbon. People drive them to work or just commute to the nearest metro station if they live somewhere further. 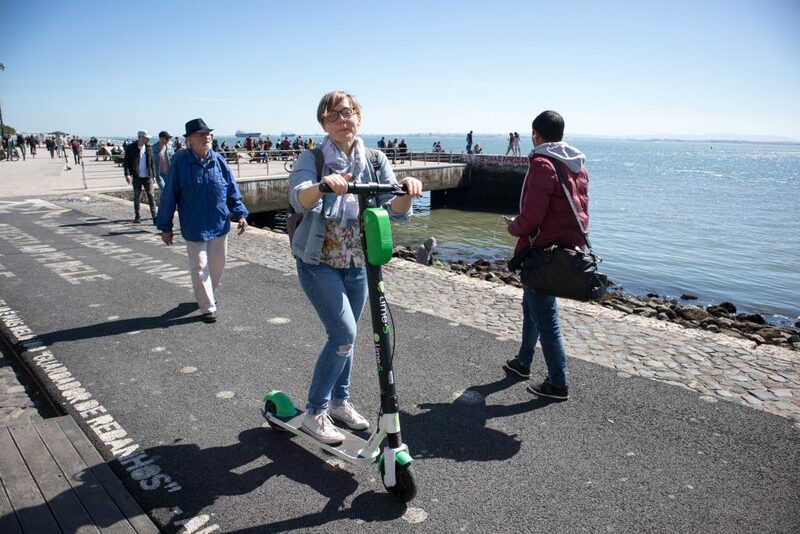 These e-scooters are prefect for sightseeing Lisbon. Bicycles Gira and Jump (Uber) is also a great way to explore Lisbon, probably even better than scooters. Because they are electrically powered, pedaling is not that tiring. It is a good option for those who want to spend time outdoors, but are too tired of climbing. If you do not have Uber’s application yet, download it today and use my discount code: joannas4551ue. The Uber bicycles are great for riding up the hill. The downside of this type of transport is quite a high price. You pay for unblocking your scooter or a bike and then 15 Cents per minute. On longer distances, the whole trip is quite expensive. I like to explore the city on my own. I like to be independent. In a city like Lisbon, where the best way of exploring the city is to get lost, a guide is perhaps not so necessary. On the other hand, if you really want to learn something interesting about Portuguese culture, customs, and history, a guide in Lisbon will be an ideal solution. 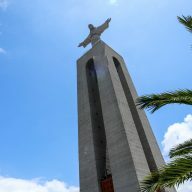 In addition to the usual trips that are offered in the city by local operators, you can find those that are not only adapted to the customer’s needs but also those where the guide will take you to the less known and popular places. Thanks to such trips you will get to know the real Lisbon, which has not yet been flooded by tourists. Here I can recommend you WithLocals. WithLocals connect local, independent guides with visitors. Each of their trips can be tailored to your needs and interests. If you are curious about how this tour looks like, take a look at my post about the Lisbon trip with Wolfgang. 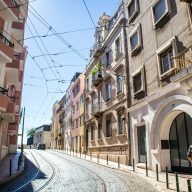 So what is the best way to explore Lisbon? It all depends on your taste and your endurance. I always say that it is best to get lost and get lost. However, if you do not have the strength, you can always take advantage of the cheap and convenient options of moving around the city mentioned earlier. 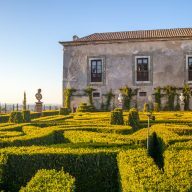 Azeitão: What to do in the ‘wine town’? Previous Post: « How to find a volunteering opportunity abroad?